Hello! Welcome to my stop on the Modern Plus Signs book hop! I’m so excited for Cheryl of Meadow Mist Designs and Paige of Quilted Blooms as they launch their new book, "Modern Plus Sign Quilts!" For the blog hop, I chose the pattern "Intertwined." The quilt is bed sized (about 68" x 88"), but more of a traditional plus sign layout. 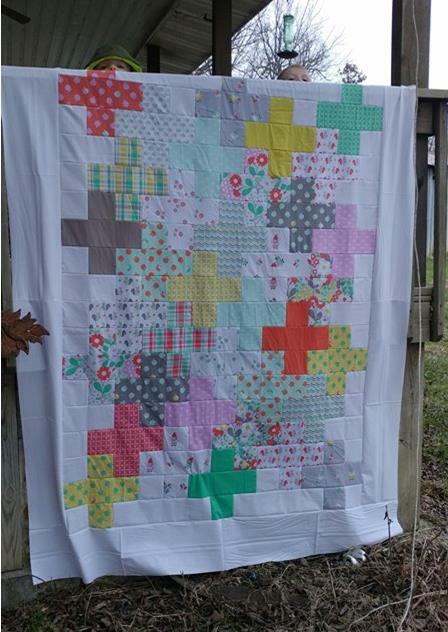 Back in January, I won a giveaway of "scraps" from Susan Emory of Swirly Girls Design. 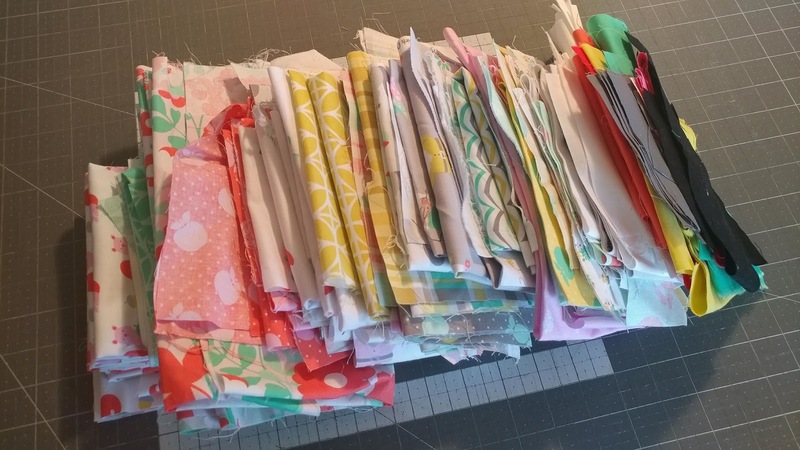 The scraps were all from Susan's new fabric line "Hank & Clementine" for Michael Miller fabrics. However, when I received them, I was blown away by what Susan considered scraps! It was an entire medium flat rate box STUFFED with fabric! There were many fat quarters and fat eighths in the box! 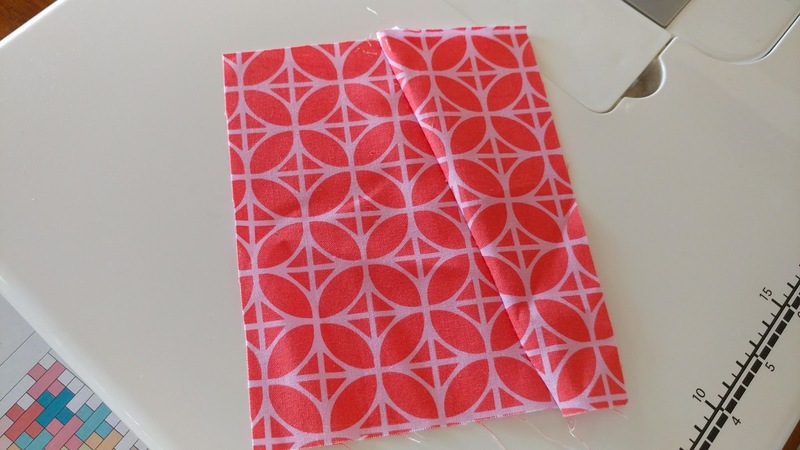 I knew it would be perfect for making the Intertwined quilt! The Intertwined pattern uses fat quarters, but I was easily able to find enough fabric in the "scraps" to use. Well, all except for one print that I had to work a little magic on. 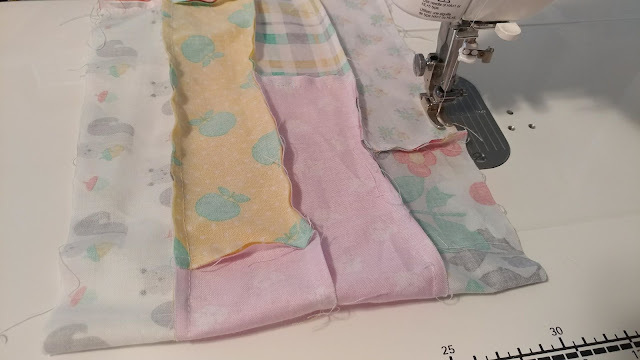 Once I finish a quilt top, I usually grab whatever wide backing fabric or yardage I have laying around and just go with it for the back. But after cutting all the print fabrics needed for the quilt, I still had a huge pile of "scraps!" I just couldn't let them linger in my stash! They were begging to be used for the back! 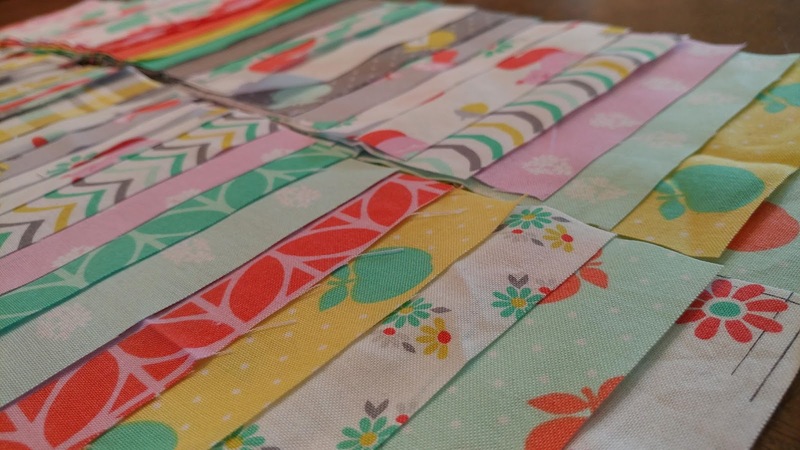 I first cut all the binding strips I would need, then started cutting all the rest of the scraps into 2 1/2" strips. I decided to also make sure none were longer than about 20" (definitely just guessed on the length though, I never measured). Based on my calculations, I would need 88 yards of strips to cover the back!! I didn't want to measure and add every single piece though, so I just cut all the scraps and hoped for the best! 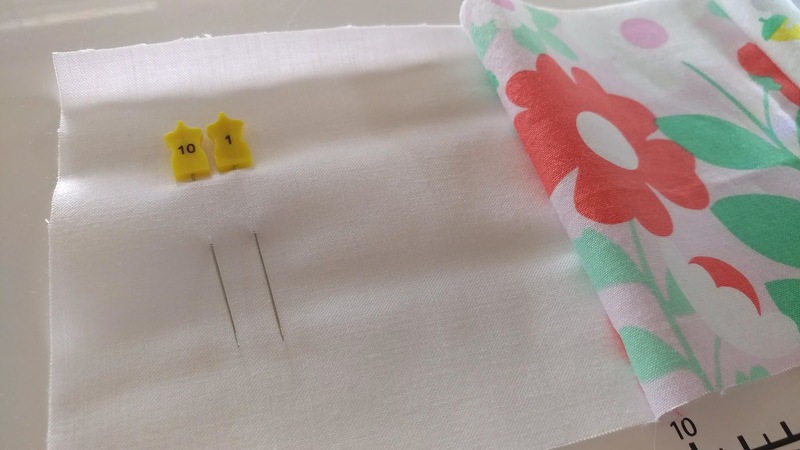 I wanted to sew the strips randomly (a concept I have yet to come close to mastering), so I decided to try a new-to-me technique: I put all the strips in the dryer for five minutes. I pulled each strip out of the laundry basket without any thought except to ensure the same fabric wasn't sewn next to each other. After all the strips were sewn together, I used my cutting mat to measure how long the strip was - 95 yards!! I just had to take it to my local football field to mark the occasion. Although a neat idea, the reality wasn't so great. 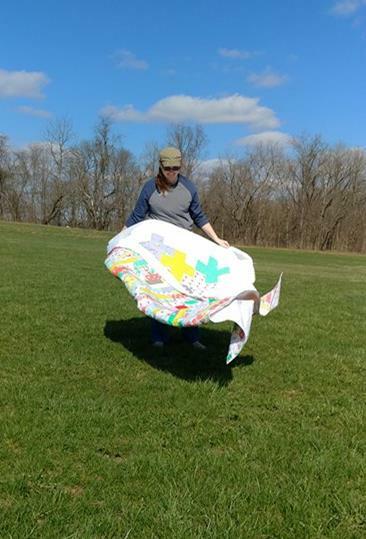 It was crazy windy, so my strip blew across the field, twisting it. Dragging it along the ground caused the fabric to fray quite a bit. And obviously they don't maintain our local football field during the off-season. I'd still do it again though! 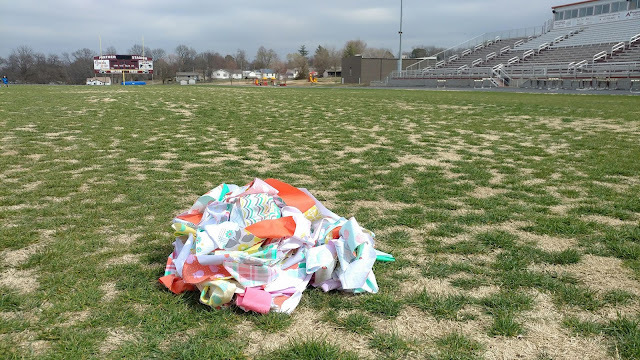 It was cool to see the little pile of fabric reach all the way across the field! Back home, I grabbed the two ends of the 95-yard strip and started sewing them together. One seam, 47 1/2 yards long! Once that seam was finished, I sewed the two ends together again to create a 23 3/4 yard long piece that was four strips wide. (Similar to a Jelly Roll Race quilt.) I kept going until it was just wider than my quilt top. After a good pressing, I made the quilt sandwich using Warm & Natural batting and pin basted. I decided to use a large meander/stipple using Aurifil 50wt thread in White #2024 (I pieced both the front and back using the same thread). I bound the quilt by machine, as usual. This was my 12th quilt finish for the year! I love the contrast of the pluses on the front and the minuses on the back! Once a math teacher, always a math geek! I highly recommend getting a copy of the book too! The patterns are very well written and there are several designs worth making more than once! 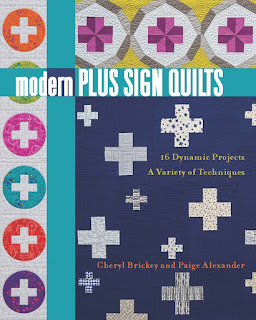 You can get a signed copy from Cheryl or Paige, request it at your local quilt shop, or order it on Amazon. 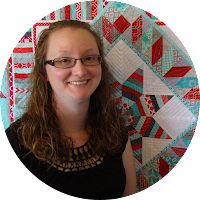 Be sure to visit all the bloggers on the hop to see their versions of the book quilts! 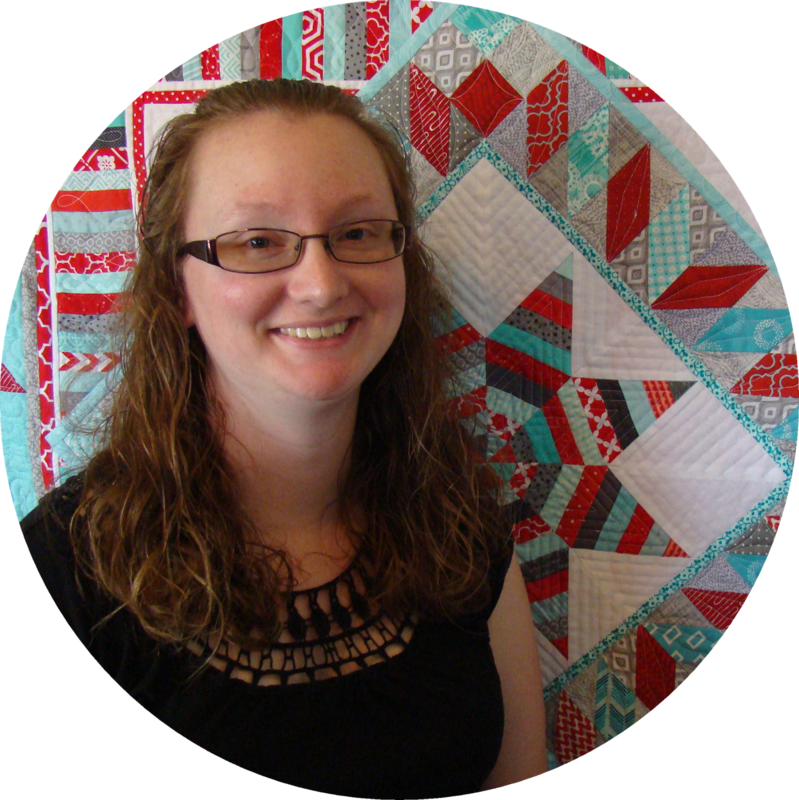 Laura @ Slice of Pi Quilts <--- That's me! Oh Laura, I love your enthusiasm and creativity. I don't think it would have dawned on me to take the length of fabric to a football field but that is awesome! I agree that those don't seem like scraps and your magic you worked was perfect. 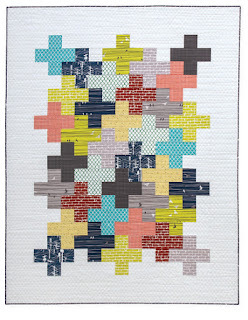 What a great version of the quilt; do you have plans for how you will use it? Oh wow it's amazing. 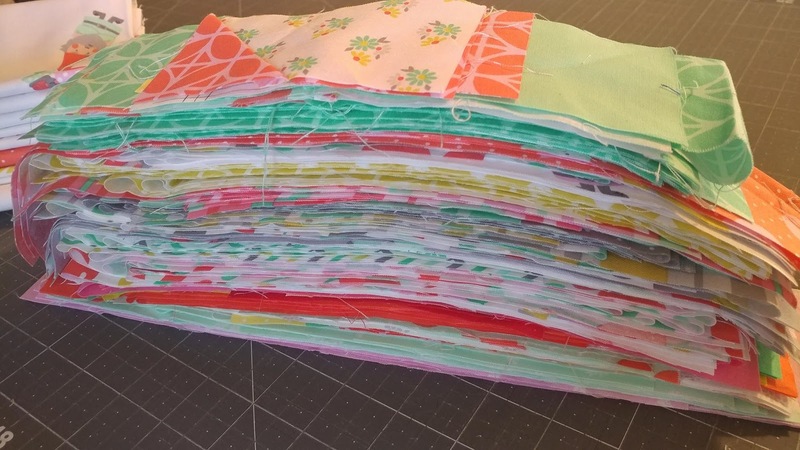 I can't believe you did all that work to do the backing, but now you have a gorgeous double-sided quilt!! What a gorgeous version of this quilt, Laura! I love the way you put that back together and I've gotta get myself some of those numbered pins! How clever! Pluses on the front and minuses on the back, Neat! Your quilt is gorgeous! I love how you did the back. I’m definitely keeping your method for a future quilt. Great job! Thanks for sharing! Maths was always my favourite subject!!! Love the binding, and the yardage!!! Phew, what a breeze there. This is a beauty. A great version, I loved the story behind it and your creative way of making the back, it now looks reversible. You must have been panicking when your strips frayed so badly, glad they were ok. I love you quilt and doing the backing that way is awesome. Wow, it's gorgeous, front and back! I got a kick out of your creative techniques in making the back! Definitely a touchdown!!! Great quilt, Laura! Love your football field idea! 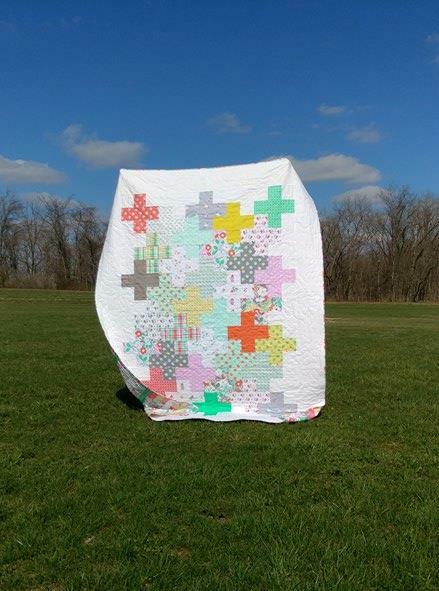 What a fun quilt - front and back! Thanks for the fun process tip on your leftover fabric scraps! And the adventure for the back was hysterical. Plus (ha, ha...) I loved that you used every bit of Susan Emory's scraps. I've taken a class from her, and she's a great teacher! Using a jelly roll race type back is brilliant. My leftovers may start to move now. 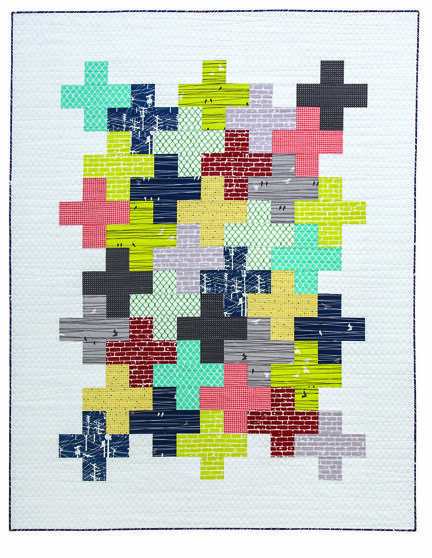 Laura, you version is so pretty and love that it is a true scrap version of Intertwined! And, yay for making scraps work! I need those numbered pins as well. Love your method of piecing the backing randomly and showing us just how long that strip really is. Thank you so much for joining the hop! Beautiful version of Intertwined! 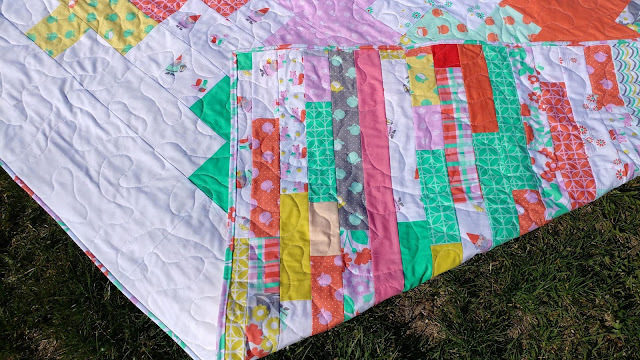 I love how you pieced the back jelly roll race style, you truly made a double sided quilt. Thanks so much fro being a part of the hop! 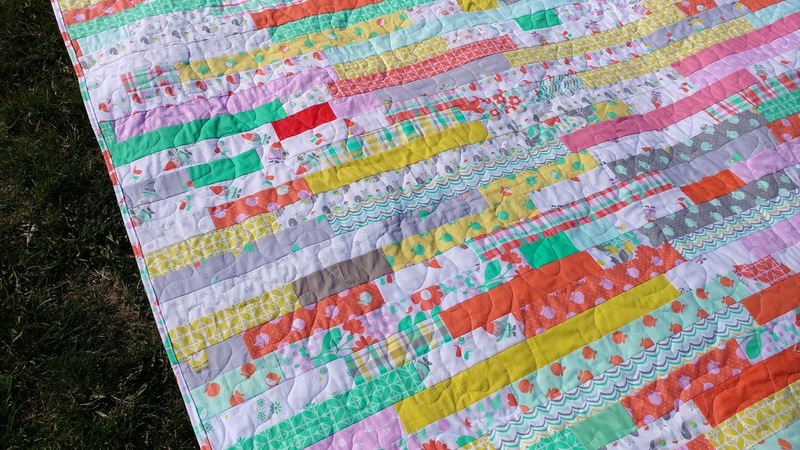 Just loving your double sided quilt! These fabrics are very pretty, it's a beautiful quilt, very nice work. I thoroughly enjoyed your process! What a perfect way to wind up this hop! Your version came out delightfully delicious. I have that same design wall! oh your blog post makes me giggle - you enthsiasm is infectious!!! I love your dryer randomizer!!! Lovely quilt and great fabric choices!!! Love this post, beautiful job! Oh...my...god! Your adventure with the back is mind blowing, hilarious and crazy! It is beautiful though! I love your version of this quilt. I think totally scrappy is the way I would have gone! Beautifully done!! You are so funny - going out to a football field to photgraph the “string” ! I do love your version and the fact that it a +/- quilt for the geek in you is even more amazing. Another terrific interpretation and finish! Such an interesting process! Thank you for sharing details of what you did. The back looks as great as the front. LOL! That's crazy about the football field! I'm glad you had fun with it, and the quilt is beautiful. This is SO sweet! I won a fat quarter bundle during fall market of this very collection....what an adorable way to highlight the sweet, light prints! 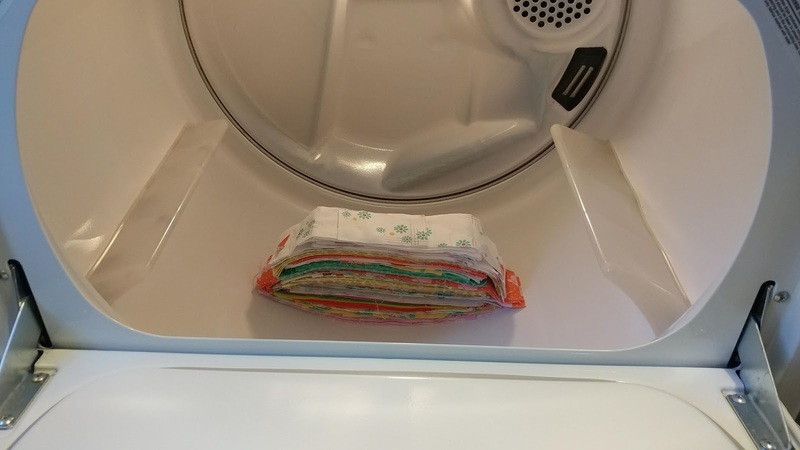 I love the tumble dry scramble method too! What a fun quilt, front and back! You seem to have such fun making your quilts. (referring to tossing them in the dryer and running them across a football field!) The backing turned out great! 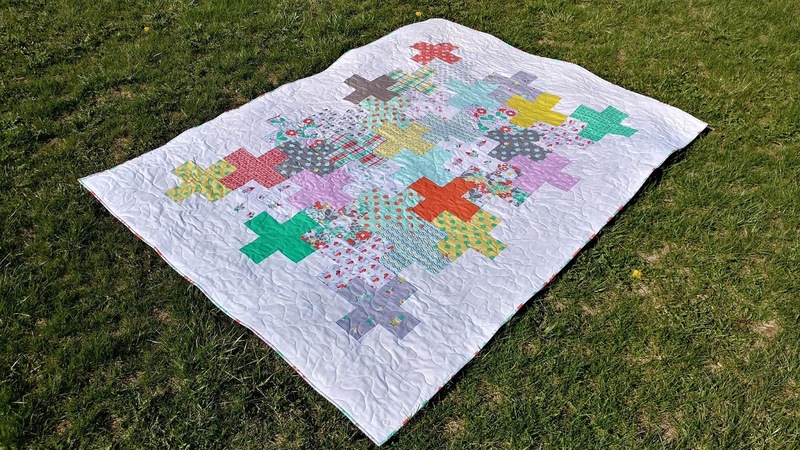 Lovely Plus Sign quilt! 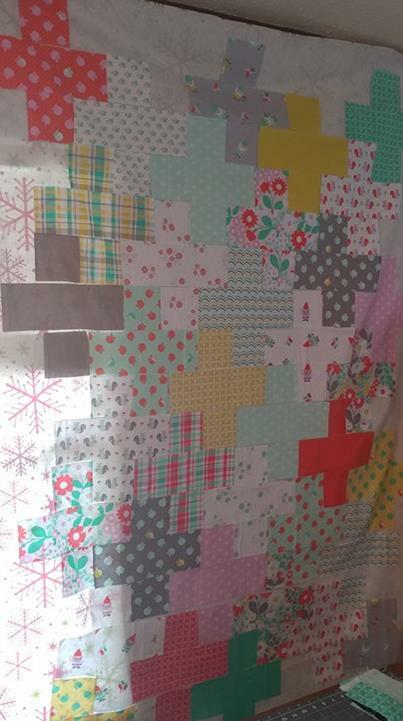 Plus "minus" sign quilt! I'm into Math, also. Quilters see things that non-quilters don't, I guess sometimes. Fabulous quilt and the story behind it. Loved hearing this post. Morning coffee and a great quilt story, wonderful start to my day. This was a fun post to read. Love those fabrics in the quilt! That was a very generous pile of "scraps" she sent :) It's hard to believe all those strips stretched that far across the field. Congrats on your plus finish! Wow! Two GORGEOUS quilts in one right there. You sound like you had a blast with those scraps. Your trip to the football field made me grin. Great quilt and fun post! OK, OK, I admit it... those were large scraps!! The important thing is that you used them and they would still be sitting in a pile at my house. I LOVE what you did with them!!!!! It's an awesome quilt and I love the minuses on the back. I also love that you took it to a football field! What a fun post to read about your process and what a great quilt you ended up with! Nice job!! Oh, Laura! You never cease to amaze me! This version is so adorable and the backing is to die for! 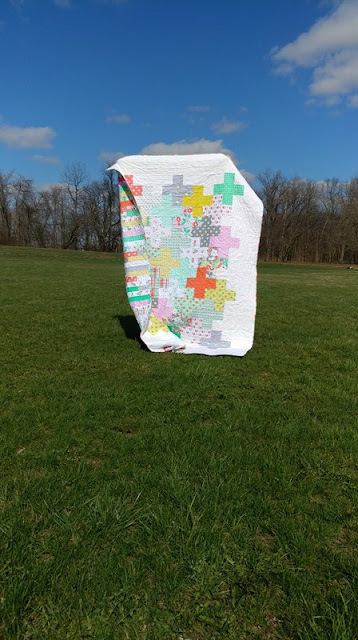 What a great quilt you made and what an awesome idea for the backing! It really is reversible and perfect colors just in time for Spring. You made such good use of your friend's "scraps". Congrats! I love that you made sure to use most of the fabric in the quilt, front and back. I love that you look at the back as minuses. 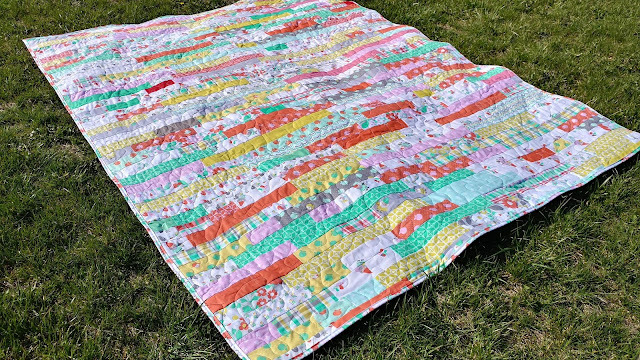 The fabric was a great for this quilt and you made a beautiful quilt. Fantastic quilt and post! Gotta admit I was so excited to see how the random back turned it was all I could do to read before scrolling to the next, then the next photo - but I did read first! The football field photo was worth the bit of fraying that occurred. Well done! Awesome idea for the back! I’ll have to try this. Love your version! That is a great backing, I wonder if I could use up ugly fabric to make some nice fabric. 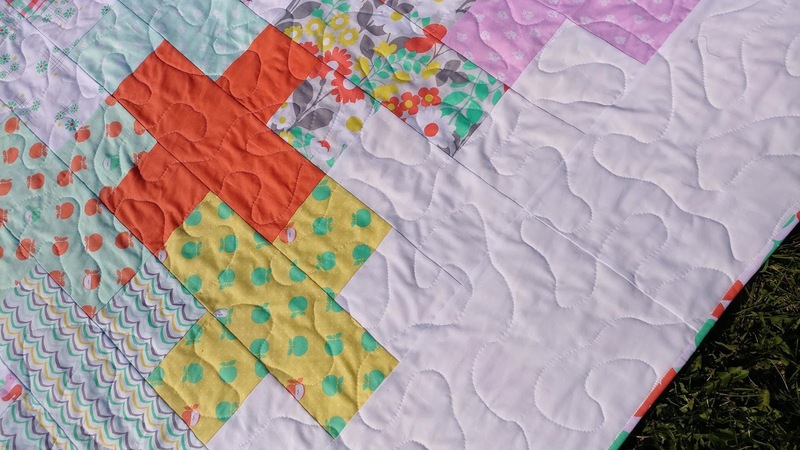 I love that you used scraps for both the front and back of the quilt. I think that this is one of my favorite patterns from the book. Thanks for sharing. I love that you took your quilt-back-strip to a football field SO MUCH!!!!! I'm sorry that it didn't come out as picturesque as you had hoped. 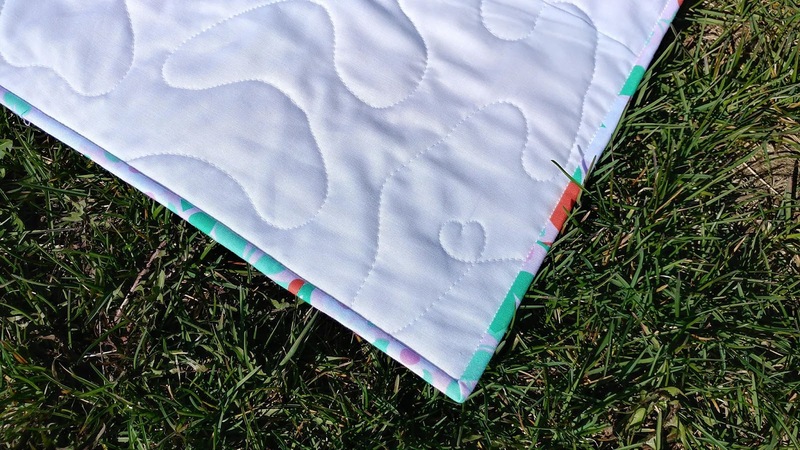 Beautiful quilt, and it's so great that you have a matching back for a two-sided quilt. Seriously, I'm still marveling at the foot ball field! Great result. What a lovely selection of fabrics, too. Love the front but the back is amazing too. I love your version of the quilt front and the back is just amazing! What a brilliant idea you had. I love how you did the back! Great story. Plus and Minus signs! Fun! I love it! Plus on the front Minus on the back! What a lovely quilt Laura. And you had me laughing thinking of you on the football pitch with your yards and yards of fabric!!! Love this! I especially love reading about your process, which was fun and a little bit crazy. 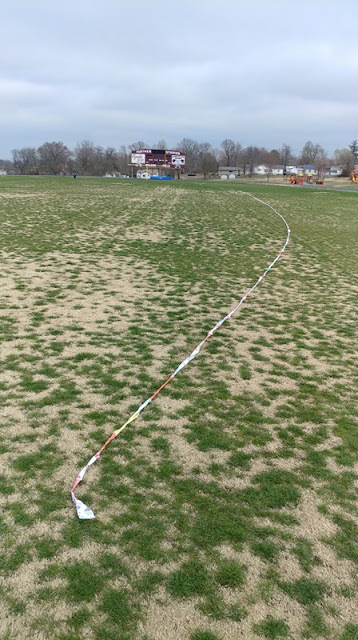 Genius idea for example to photograph your long binding strip on a football field, but a little crazy with that wind! 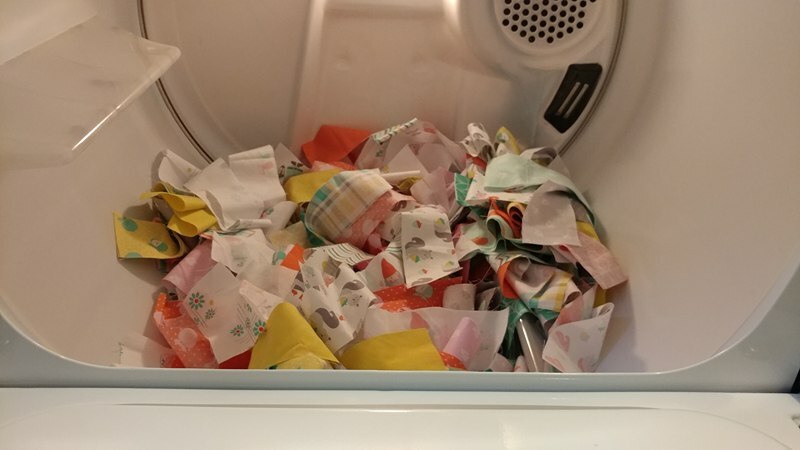 Awesome to flip the fabrics around in a dryer to mix them up, but yeah a little crazy. I just loved reading this! So much fun and the result as always with you, is perfection.